The above photograph shows members of the press holding their NBC press releases and photographs in front of the new RCA 12" iconoscope. 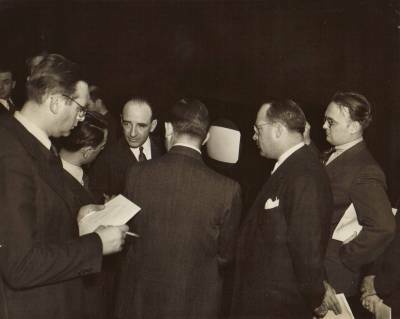 They are listening to Lenox Lohr, president of NBC (Dr. V. K. Zworykin is also pictured, second from the right). What follows is the complete text along with photographs contained within the envelopes they are holding from RCA/NBC Television. The only additions are the "Inkspots" picture and autographed Eddie Albert photograph. These were not included in this press kit but are in my collection. Television program transmission was demonstrated for the press today (Friday, November 6) by the National Broadcasting Company in a 40-minute program illustrating RCA experimental developments. The pictures were broadcast from the transmitter on top of the Empire State Building, and were received on the 62nd floor of the RCA Building. David Sarnoff, President of the Radio Corporation of America, reported on results of field tests conducted by the company engineers since September 1 last. Lenox R. Lohr, President of NBC, discussed the practical problems presented in staging performances for the air. 1936, Eddie Albert and Grace Brandt in Albert's "The Love Nest". This was televisions first original drama, and written by Eddie Albert. The demonstration possessed four features not included in previous press demonstrations of television. 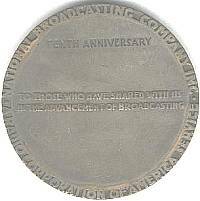 It was the first made by RCA and the National Broadcasting Company for the press under practical working conditions, although previous demonstrations of laboratory television have been given. It represented the first showing of a complete program built for entertainment value as well as a demonstration of transmission. It also included the first showing of the new 12-inch receiving tube, which reproduces a picture on a 7 ½ by 10-inch screen. This is the largest screen yet employed which is capable of commercial adaptation. 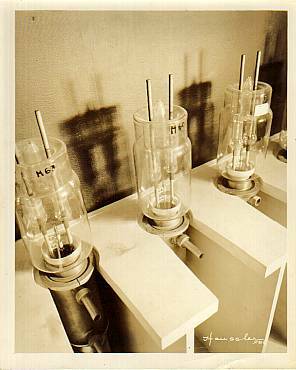 Introducing RCA's experimental field test 1936 RR-359 9" receiving set. A newer version of this was used for this demonstration which had a 12" picture tube. A fourth feature of the demonstration was a television tour behind the scenes. By means of an especially prepared moving picture film, the guests were conducted through the NBC television studios in the RCA Building and the transmitter station at the top of the Empire State Building. 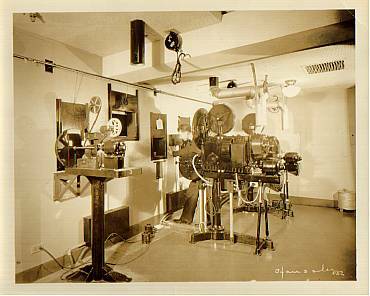 The watchers in front of the line of receivers installed for the demonstration saw the processes whereby performances by “live” talent are transformed into pictures through the air, witnessed the scanning of moving picture films, and observed in detail the intricate television apparatus in actual operation. Besides the talks by Messrs. Sarnoff and Lohr, and the behind-the-scenes film, the audience was entertained by the Inkspots (The Ink Spots), colored comedy teams, and Hildegarde, “The Television Girl,” in characteristic songs. A Bob Benchley short and a selection of newsreel subjects also were demonstrated by television. 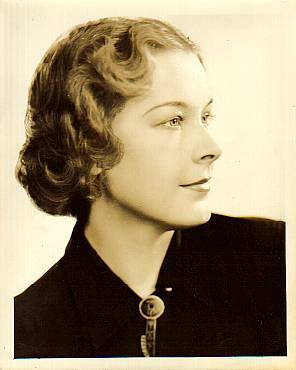 The program was announced by Betty Goodwin, of the NBC Press Department. 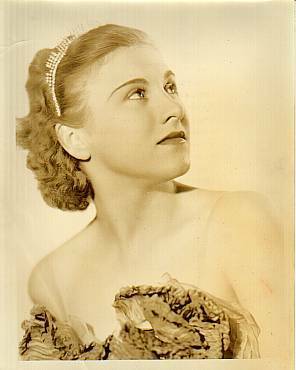 Left; Hildegarde, international star performed 2 live songs. 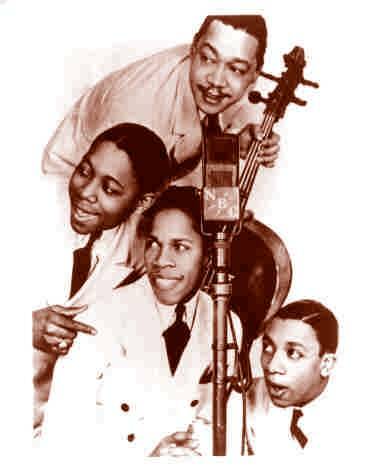 Right; The Ink Spots performed live also, (Inkspots from the top; Hoppy Jones, Deek Watson, Bill Kenny, and Charlie Fuqua) , these were television firsts! Music Television and the spirit of MTV should mark November 6, 1936 as their birth. The demonstration was presented and supervised by Ralph R. Beal, RCA Research Supervisor; O(scar) B. Hanson, NBC Chief Engineer, and Charles W. Horn, NBC Director of Research and Development. These engineers explained that numerous problems of transmission and production will still remain to be solved before television on a commercial scale can be attempted. 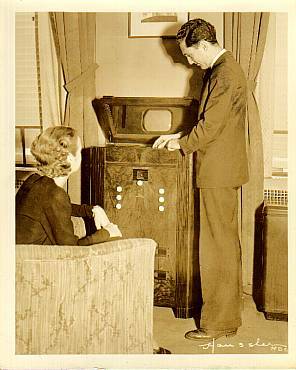 The demonstration was the first showing for the press of RCA experimental television under practical field conditions since the Radio Corporation of America assigned the task of setting up a television operating plant to the National Broadcasting Company. 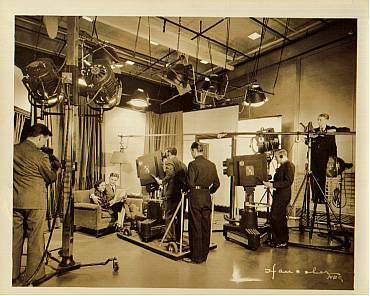 This assignment included the construction of studios adapted to television technique, the installation of equipment in those studios and at the transmitter atop the Empire State Building, the determination of workable engineering methods for the transmission of the pictures, and the training of a staff to take over the operation of the plant. The film projector room at Radio City. Two large projectors are for 35mm film. The small projector in the foreground is for 16mm films. A Bob Benchley short and a selection of newsreel subjects also were demonstrated by television. 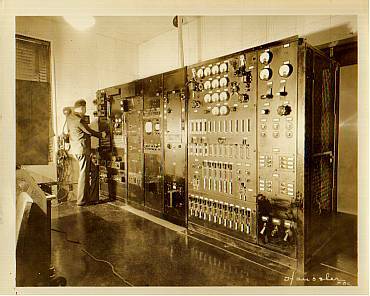 A view of the Control Room Panel from NBC's transmitting station atop the Empire State Building. The center rack contains a monitoring screen used to check the picture during broadcasts. National Broadcasting Company RCA Building, Radio City, N.Y.
On behalf of the National Broadcasting Company, I extend a cordial welcome to the representatives of the press who are assembled upstairs to see this television demonstration. What you will see today is the result of tireless effort on the part of many men and the expenditure of huge sums over a period of many years. The success of these efforts you can judge for yourselves. But, at last, television is out of the laboratory and into the field, undergoing tests which will assure that it does not reach the public until it is capable of satisfactory service. The role of the National Broadcasting Company in television will be operating transmitters, programming, and, when it becomes available for commercial use, securing sponsors. In order that we may be prepared to do our part, our engineers are daily putting apparatus on the air under practical service conditions. 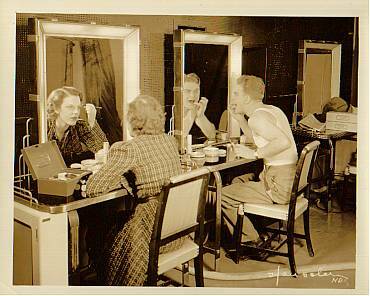 Top; Grace Brandt and Eddie Albert apply heavy make-up. The basic makeup was green toned with purple lipstick for the iconoscope pick up camera. 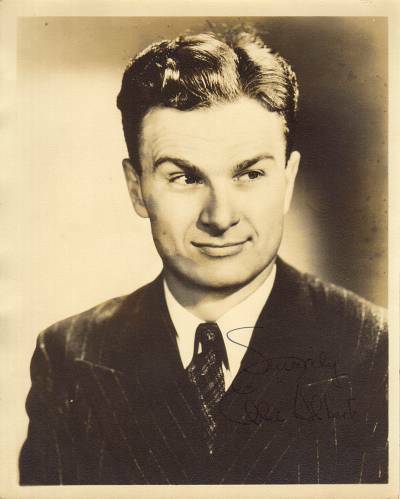 Below; This is how a young Eddie Albert appeared before make-up. Eddie Albert Heimberger, Born April 22, 1908 in Rock Island, Illinois. Eddie was 28 years old then he starred, produced even wrote his own script for this television experimental performance. He had teamed with a singer Grace Bradt, and they spent a year as the singing stars of "The Honeymooners," an NBC morning radio show. Our Program Department is learning an entire new technique in continuity writing, make-up, staging, and a multitude of other details which this new art will demand. It is experimenting with commercial programs to determine the effectiveness of televison to sell goods. Our engineers are studying the economics of networking, so that several stations may be interconnected by either coaxial cable of short-wave relays, and are developing equipment for the making of outside pick-ups. With the experience that we are gaining daily, we feel that when the time is ripe to offer television to the public, the National Broadcasting Company will be prepared to do its part. 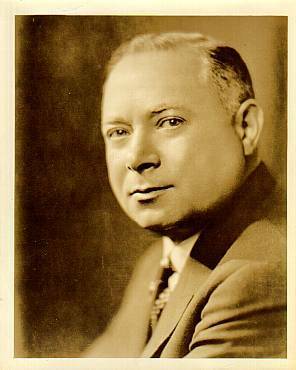 As you see television put through its paces here today, you will see results which are largely due to the vision and enterprise of Mr. David Sarnoff, President of the Radio Corporation of America, who will now speak to you. In view of the public interest in the promise of sight as well as sound through the air, we have invited you here today to witness an experimental television test so that the progress in this new and promising art may be reflected to the public factually rather than through the haze of conjecture or speculation. You will recall that our field tests in television began only on June 29 of this year. That date marked the beginning in this country of organized television experiments between a regular transmitting station and a number of homes. Since then we have advanced and are continuing to advance simultaneously along the three broad fronts of television development–research which must point the road to effective transmission and reception; technical progress which must translate into practical sets for the home the achievements of our laboratories; and field tests to determine the needs and possibilities of a public service that will ultimately enable us to see as well as to hear programs through the air. On all these fronts our work has made definite progress and has brought us nearer the desired goal. First and as of immediate interest, let me tell you the progress of our field tests. As you know, we have been transmitting from our television station on top of the Empire State Building in New York City which is controlled from the NBC television studios in the RCA Building. We have observed and measured these transmissions through a number of experimental receivers located in the metropolitan area and adjacent suburbs. The results thus far have been encouraging, and instructive. As we anticipated, many needs that must be met by a commercial service have been made clear by these tests. We have successfully transmitted through the air, motion pictures as well as talent before the televisor. The distance over which these television programs have been received has exceeded out immediate expectations. In one favorable location due to extreme height of our transmitter, we have consistently received transmissions as far as 45 miles from the Empire State Building. The tests have been very instructive in that we have learned a great deal more about the behavior of ultra short waves and how to handle them. We know more about interferences, most of which are man made and susceptible of elimination. We have surmounted the difficulties of making apparatus function outside of the laboratory. We have confirmed the soundness of the technical fundamentals of our system, and the experience gained through these tests enables us to chart the needs of a practical television service. We shall now proceed to expand our field test in a number of ways. First, we shall increase the number of observation points in the service area. Next we will raise the standards of transmission. 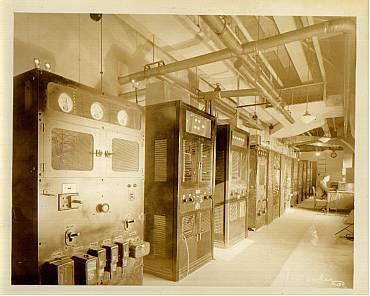 Racks of transmission equipment at NBC Empire State tower transmitter. These are half audio and half video and transmit sound and picture from a single antenna. In our present field tests we are using a 343 line definition. Radio Corporation of America and the radio industry have, through the Radio Manufacturers Association, recommended to the Federal Communications commission the adoption of 441 line definition as a standard for commercial operation. Our New York transmitter will be rearranged to conform to the recommended standards. That also means building synchronized receivers to conform to the new standards of the transmitter. Synchronization of transmitting and receiving equipment is a requirement of television that imposes responsibilities upon those who would furnish a satisfactory product and render a useful service to the public. On the one hand, standards cannot be frozen prematurely or progress would be prevented, while on the other hand, frequently changing standards means rapid obsolescence of television equipment. Basic research is a continuing process in our laboratories not only that the problems of television may be solved but also to develop other uses of the ultra short and micro waves which possess such vast potentialities in this new domain of the ether. While we have thus proceeded on the technical front of television, the construction and operation of television studios have enabled us to coordinate our technical advance with the program technique that a service to the home will ultimately require. Today, you are the guests of RCA’s broadcasting unit –the National Broadcasting Company. 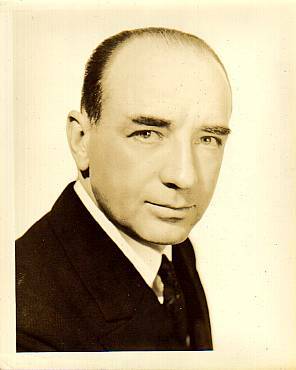 Under the direction of its president, Mr. Lenox Lohr, the NBC has instituted a series of television program tests in which we have sought to ascertain initial requirements. 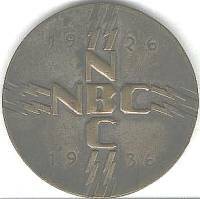 Ten years ago the National Broadcasting Company began a national service of sound broadcasting. Now it enters upon its second decade of service by contributing its facilities and experience to the new art of television. One of the major problems in television is that of network syndication. Our present facilities for distribution of sound broadcasting cover the vast area of the United States and serve its 128,000,000 people. Similar coverage for television programs, in the present state of the television art, would require a multiplicity of transmitters and network interconnection by wire or radio facilities still to be developed. Our program is three fold; first we must develop suitable commercial equipment for television and reception; second, we must develop a program service suitable for network syndication; third, we must also develop a sound economic base to support a television service. From the standpoint of research, laboratory development, and technical demonstration, television progress in the United States continues to give us an unquestioned position of leadership in the development of the art. In whatever form such progress may be evident in other countries, we lead in the research which is daily extending the radio horizon, and in technical developments that have made possible a transmitting and receiving system that meets the highest standards thus far obtainable in field demonstration. We are now engaged in the development of studio and program techniques that will touch upon every possibility within the growing progress of the art. The distinction between television in this country and abroad is the distinction between experimental public services undertaken under government subsidy in countries of vastly smaller extent, and the progressive stages of commercial development undertaken by the free initiative, enterprise and capital of those who have pioneered the art in the United States. While the problems of television are formidable, I firmly believe they will be solved. With the establishment of a television service to the public which will supplement and not supplant the present service of broadcasting, a new industry and new opportunities will have been created.